Business models have changed over the years for small start-up companies. The civic leaders of Fayette realized this and sought ways to continue the “business-friendly” environment that has been a hallmark of the city. Over the years Fayette has been the starting place for several companies that became well established outside their home area. The business leaders of the City are determined to continue the opportunities that have characterized the city and area. Knowing the creative business history of the area, the talents and work ethic of it citizens, the civic leaders of the City of Fayette and Fayette County sought input about various possibilities. They reached out to potential partners at the University of Alabama, Bevill State Community College, multiple state agencies, C3 of Northwest Alabama, the National Business Incubation Association, private individuals and other parties with possible interest. Their efforts have came to fruition in the creation of the Fayette Center for Manufacturing and Innovation. 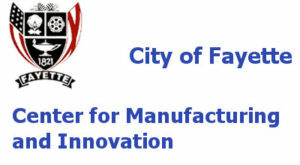 The Fayette Center for Manufacturing and Innovation came into being in January 2014 with the emergence of Fayette Fabrication as the first tenant in a building previously used in the garment industry. The building was modified to facilitate the production capabilities of a new start-up company to serve the automotive industry. A part of the building has since been further modified to provide spaces for working artists of the Sipsey Arts Alliance. Additional work has been performed to create offices for new companies that will be occupying more space. This “mixed use” concept makes it possible to have both office and flex space for manufacturers, technical, research and creative enterprises. The Center has been a joint effort of several local and state agencies to bring about the creation of a “business incubator” for small business in the Northwest Alabama area. Fayette is a proud member of the National Business Incubation Association, which reports over 1,250 business incubators nationwide. Very few are in towns as small as Fayette, which is the smallest town in Alabama hosting such an endeavor. W P Brown & Sons Lumber employed 300-400 people in the mill and several hundred in the woods. Fayco, sold to ST Bunn, was once the largest user of US Steel culvert sheet in the nation. Fayette Hatchery made several significant contributions to the poultry industry before being sold. Fayette Manufacturing Company grew to over 500 employees before the textile decline in the 1990’s. The City of Fayette recognizes the physical requirements of a new business must be matched by administrative capabilities also. To augment a new venture’s abilities in this area the Center provides experts in business organization and structure, staffing, training support, funding, incentive/grants, market opportunities, customer care, risk management, and creative business solutions. The Center is also ready to assist with all governmental forms and tax information.